This is a scalable context timeline. It contains events related to the event January 10, 1997: Defense Lawyers in Oklahoma City Bombing Attempt to Suppress Witness Testimonies. You can narrow or broaden the context of this timeline by adjusting the zoom level. The lower the scale, the more relevant the items on average will be, while the higher the scale, the less relevant the items, on average, will be. Timothy McVeigh (see November 1991 - Summer 1992, February - July 1994, September 12, 1994 and After, and September 13, 1994 and After), developing plans to bomb a federal building in Oklahoma City (see 8:35 a.m. - 9:02 a.m. April 19, 1995), buys 10 bags of ammonium nitrate fertilizer from the Mid-Kansas Cooperative in McPherson, Kansas, about 70 miles west of Herington, where McVeigh has rented a storage locker (see September 22, 1994). The Mid-Kansas Coop is the largest farm supply and grain cooperative in Kansas, and has branch locations in 19 cities and towns. The ammonium nitrate can be mixed with other materials to create a powerful explosive; the brown and white bags are clearly marked “Warning” and “Explosives.” [PBS Frontline, 1/22/1996; Mickolus and Simmons, 6/1997, pp. 810; Serrano, 1998, pp. 92; Douglas O. Linder, 2001] Presumably McVeigh and his partner Terry Nichols are keeping the fertilizer in the Herington storage locker (see September 22, 1994). 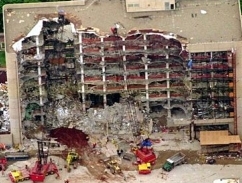 Oklahoma City bombing conspirator Terry Nichols (see September 13, 1994 and After, September 13, 1994, September 13, 1994, and 8:35 a.m. - 9:02 a.m. April 19, 1995) buys 40 50-pound bags of ammonium nitrate—one ton—from the Mid-Kansas Cooperative branch in McPherson, Kansas. Nichols buys the fertilizer under an alias, “Mike Havens.” Nichols’s co-conspirator, Timothy McVeigh (see November 1991 - Summer 1992 and September 13, 1994 and After), bought 10 bags of the same fertilizer, which can be used to make a powerful explosive, the week before (see September 23, 1994). “Havens” turns down the offer of applying for the farmer’s tax exemption. The FBI will later find the receipt for today’s purchase, with a fingerprint belonging to McVeigh (see May 1, 1995), for $228.74 in cash. McVeigh also buys eight bags of ammonium nitrate in Manhattan, Kansas, one bag in Burns, Kansas, and six bags in a town near McPherson. [PBS Frontline, 1/22/1996; Mickolus and Simmons, 6/1997, pp. 810; Washington Post, 12/24/1997; Douglas O. Linder, 2001] Presumably they are keeping the fertilizer in a storage locker in Herington (see September 22, 1994). Fred Skrdla, who worked at a gasoline station in Billings, Oklahoma, some 80 miles north of Oklahoma City, on the day of the bombing. Skrdla remembers a man driving a large Ryder truck (see April 15, 1995) buying gasoline between 1 a.m. and 3 a.m (see (1:00 a.m.) April 19, 1995). The man paid cash. Skrdla says he was busy and does not remember if the man was alone or had company. When he saw composite drawings of “John Doe No. 1” and “John Doe No. 2” (see April 20, 1995), he recognized one of them as the man who bought the gasoline. When he saw television coverage of McVeigh being “perp walked” out of the Noble County Courthouse in Perry, Oklahoma (see April 21, 1995), he became sure that the man he saw paying for the gasoline was McVeigh. William Dunlap, who took his wife to work in Oklahoma City on the day of the bombing. Minutes before the bomb detonated in front of the Murrah Federal Building, Dunlap told FBI investigators, he drove past the building and noticed a Ryder truck parked in front of it. Dunlap said he saw a white man get out of the truck and walk to the rear of it. Dunlap said the man wore jeans, was in his mid- to late 20s, had “clean-cut” hair, a “medium” complexion, a slight build, and was between 5’8” and 5’9” tall. McVeigh is 6’2”. Dunlap told investigators he thought the man might have been McVeigh, but he was not certain.